Villa Nusa Kecil is a versatile, private home in a beautiful secluded setting, with great views of the island, ocean and Mount Agung. 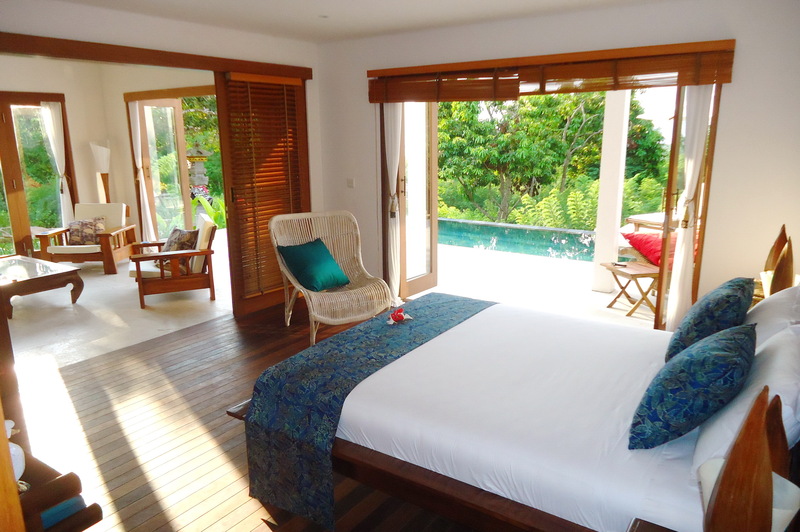 Villa Nusa Kecil offers a main, ground floor double room with bathroom; spacious mezzanine with sofa bed, balcony and shower room; ground floor lounge; fully fitted kitchen and a private pool with gazebo and stunning views. This peaceful location is away from the main tourist centre but only a three minute scooter or truck taxi ride, or a 12 minute walk, takes you to the main Jungut Batu beach strip. Here you will find hotels, bars and restaurants, spas, dive centres, boat hire, surfing instruction and other visitor facilities. To the west and south of the island, there are a number of popular beach resorts which host a variety of restaurants and bars just steps from the water’s edge. Many offer door to door complimentary transport services to save you worrying about wobbling home in the dark! 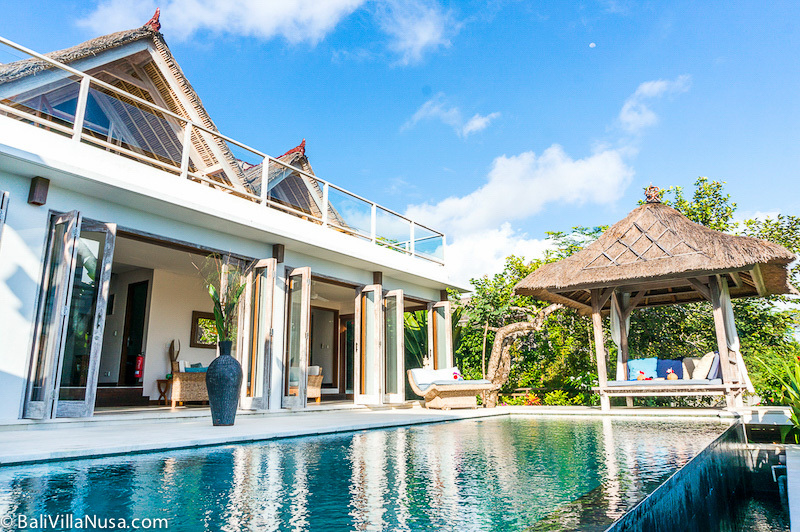 Villa Nusa Kecil’s ground floor includes a fully fitted kitchen and relaxing lounge area with folding doors opening on to its own infinity pool with stunning views. The living space is light and airy and can be opened up for outdoor / indoor living or closed for a more cosy and intimate ambiance. The master bedroom suite is also on the ground floor with queen size bed, air conditioning and semi-open tropical bathroom with a free standing stone bath tub and shower. 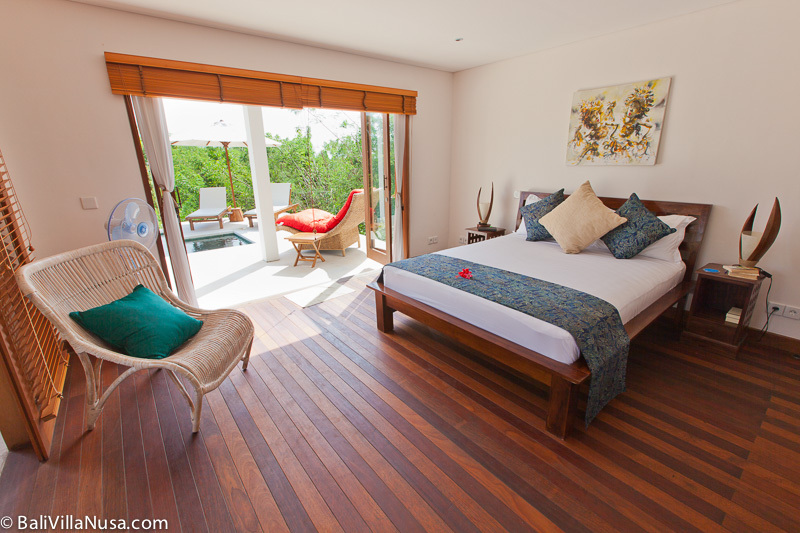 From the bedroom there is also direct access to the pool. On the pool side you’ll find sun loungers, bean bags and a beautiful cushioned gazebo which is perfect for relaxing in and absorbing the island views and vibe. 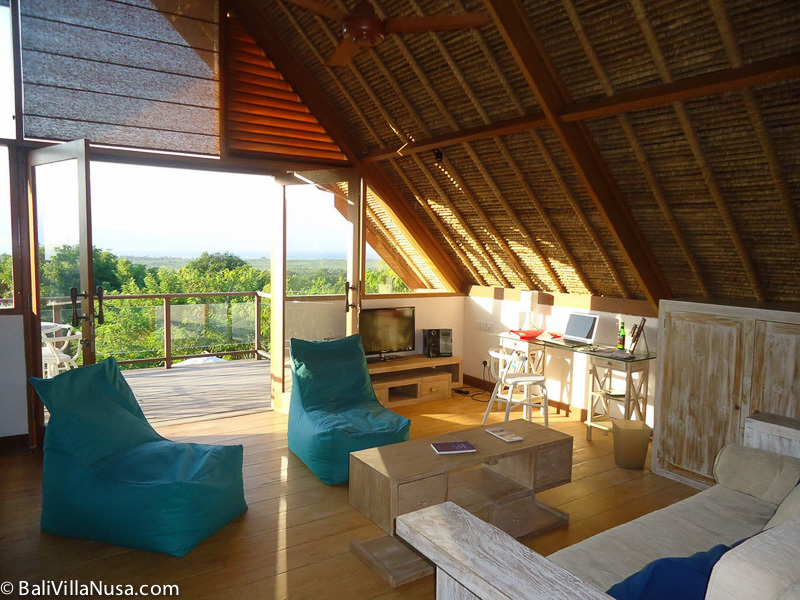 The mezzanine level of Villa Nusa Kecil is extremely versatile and can be used as an extended living area or as a second bedroom. The space has a double sofa bed and its own shower room. 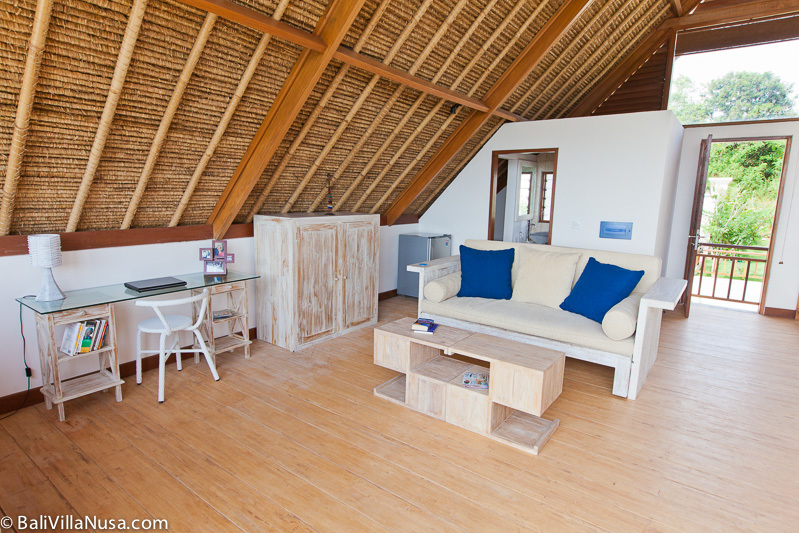 One of the highlights of this space is the traditional alang-alang woven roofing. The views from the mezzanine balcony are stunning and it’s a great viewing point at sunset. Below is a living space configuration but this can easily be transformed into a beautiful sleeping space with it’s own shower room. This space can also be accessed via its own dedicated staircase so if your group dynamic is operating on different schedules, your mezzanine guests do not need to enter through the ground floor. 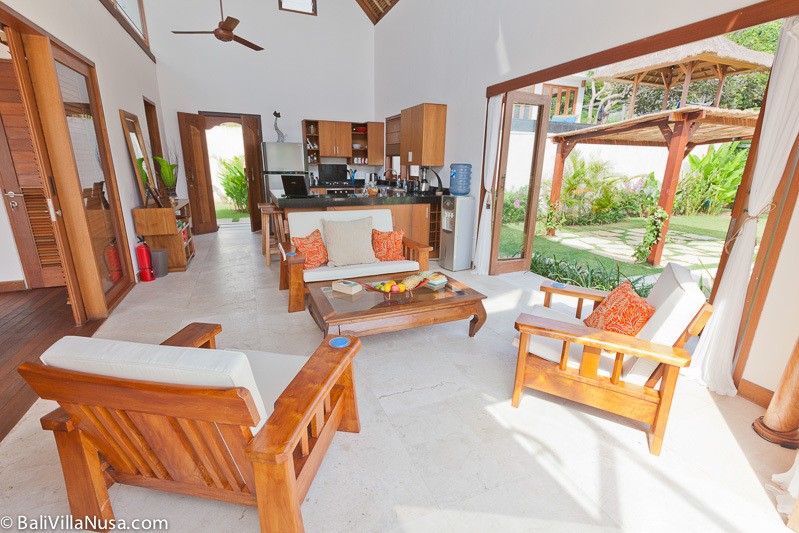 Villa Nusa Kecil is self-catering and there are a range of options from which you can choose. If you would like to have the fridge stocked before your arrival we will send to you a list of food and beverages (with prices) which you can choose from. Any items that are not on the list can be requested and every effort will be made to fulfil the request if the items are available. There are also many local warungs and good international restaurants on the island, none more than 10 minutes away on a scooter, and some which offer pick-up and drop-off services so you don’t have to worry about how to get there or back. There are also numerous restaurants that are happy to bring anything you order from their menus (in the Villa) for breakfast, lunch or dinner. Or, if you prefer, we can arrange the services of a very good cook, trained in an international hotel for many years, who will come to the Villa and cook either breakfast or dinner for you. The choice is yours. 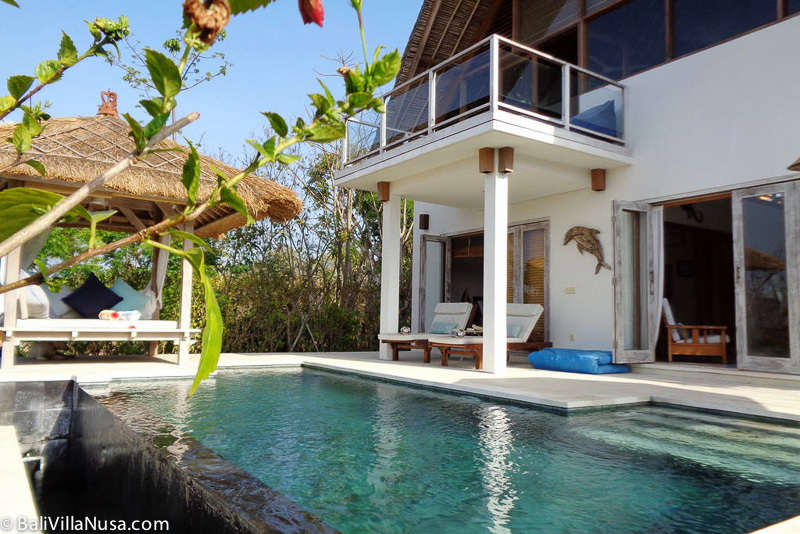 Villa Nusa Kecil and Villa Nusa can be reserved together for larger groups who would like to enjoy both properties. To ensure that you can totally relax during your stay at Villa Nusa Kecil the staff will look after everything for you including housekeeping, laundry, shopping, organizing any activities you want to do. Komang, the House Keeper is a fully trained Masseur if you feel like being pampered. Our local staff are friendly, helpful and knowledgeable about the island. If you need anything or have any questions, just ask them – they are here to help!